Fans of classic old movies will be happy to hear that Network Distributing have some more titles in The British Film coming our way on DVD. 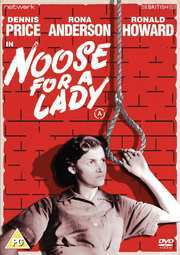 One of these, out on 5th May is the thriller Noose For a Lady, directed by German-born writer, producer and director Wolf Rilla and starring Dennis Price, Rona Anderson and Ronald Howard. Originally released in 1953, this comes with a brand-new transfer from the original full frame film elements, with extras that include an image gallery, promotional materials in PDF format and trailer. The runtime is 70 minutes, whilst the recommended retail price will be £9.99. Simon Gale returns from Uganda to find his cousin, Margaret, has been convicted of poisoning her husband, and her execution is only seven days away. Refusing to believe in her guilt, Margaret’s stepdaughter Jill sets out to find the real killer, questioning everyone remotely connected with the dead man. As far as Simon is concerned, everyone is a suspect, and when the man who had promised him vital information is found poisoned, he believes he has solved the mystery.